Hidden in the nights within a blanket of black, a man roamed the stone passages of a place long forgotten but not to he. A place whose inhabitants were stone and stone were time. Nothing but time; stone, time, the dark and a man whose steps were followed by paws. His companion, a dog of a strays breed wandered aside him. None a name for either, for they may have once been fateless and still are for the matter. Age had no place on them where light and sound seemed unexisting were it not for their breaths that took in the sanded air and dusts, nor the flame of a single torch their guide. A man of rags and leather, whose hairs grew from coal to silver and a mongrel whose voice spoke in a younger man's tongue. A head of stone without a shoulder to rest upon lay in the midst of the floor's sand. Here the man stopped and so took of it preciously and rubbed away at the grain to stare into the cold eyes he recognized. In here were stories and this shade of a man, a monument not far from it's keeper, held a story most captivating of all. It is here where all stories start and so did the man's voice to his companion. "Daedalus, the Master Who designed this labyrinth; whose mind produced these dizzy passages. Daedalus the Genius who invented ships which could sail under the sea, Fireworks which would knock down a wall. Lenses that, set together, could see as far as the stars.Fantastic machines; he fell so far...he fell so far from grace he finished a broken man. Making the same little clay figure over and over. A child with wings. The one thing Daedalus made he had no control over.The one thing he ever truly loved. Icarus, his son. Daedalus the greatest craftsman in Greece. There was no one like him; he was born in Athens and he learned the art of making from the Goddess, Athene herself but his greatest dream was to fly. To soar through the clouds like a bird. Is that why he came to bare the statues of a boy with wings? Did they both grow wings? No, no they didn't. Poor Icarus had nothing so graceful as wings. Even his hands were awkward and clumsy. 'Look' Daedalus would say to his son. 'Son, look!' as he would show of his own personal crafting. Toys as they were of many things: Man, beast and bird from his hands. 'wonderful!' Icarus would be mesmerized and reach with curious and fevered hand. 'Gently! You must handle things gently!' Daedalus would give in dismay and far be it late that Icarus had a way to destroy such silent treasures mistakenly. Behind Daedalus's eye was a quiet wonder and deeper he found shame.
' I'm no good. You think I'm no good.' Icarus would murmur for he could see it every now and again. ' I don't think that at all! ' Daedalus would say as he took to his son but Icarus would sometimes not hear. 'You do; You think I'm clumsy.' but his father would take of him in his arms, at first in worry but soon as always in codrial care he would bring out the play back in the young boy. 'I do not! I think your brains must have run from your head!' he would say to Icarus as he held the boy upside down; both laughing and both forgetting again. Yes, Icarus was clumsy but he was only a boy...Did he get better, more careful? Perhaps he would have done, I don't know. Something happened, something happened which changed everything. Another boy came into their lives, a golden boy. Kissed by the gods; a Nephew to Daedalus. an Apprentice.Talos whose eyes shared in Daedalus's unending thirsts for knowledge and understanding. Whose hands were sharp and quick. Daedalus would see it now and then in passings of Icarus and Talos when a shoe band might break or a toy of Daedalus's own design grow worn. The gods play with us. In Talos, his sister's boy, went all the joy of creation. The keen eye and quick wit as if the two children had been born to the wrong parent, for Talos was the kind of son Daedalus had dreamed of. Daedalus watched the boy work; his brilliance, his curiosity. The idea's came pouring from him. Daedalus watched all this and it was like a knife twisting in his heart; and every day Icarus seemed slower, more clumsy, more dull against the bright star of his cousin. Sometimes in the evenings Daedalus would climb up onto the roof, the boys clamoring after him. Then they would look out over Athens and watch the birds. They looked hardest at the vultures, watched them glide, circle or just hang in the air. ' I think what happens is the wind goes over both sides of the wings and the back of the wings go up and the air pushes the bird up.' Talos mused one evening as all three of them watched in the dusk. His eyes would no longer trace upon the skies above where the birds flew high in the air, but instead to the Athens below where darkness set. The sad heights of a tragedy already set in motion. ' You too Nephew. ' But Talos had still be so entranced by the display. ' No, I would rather stay. ' and to this Icarus spoke otherwise again ' I'll stay if you want. ' but Daedalus had already been Set against the protest. He dismissed his son away.
' I'll stay! ' Icarus said a final time before Daedalus sent him in temperament. Not very long after Icarus had left to the empty table downstairs did Talos point and delight' Look! It's landed! ' and indeed not far from their roof had a large vulture perch among another. It's blackened eyes which were cold and fully opened seemed to only stare at Daedalus with a persistence and purpose just as he stared back. It's beak parted and it began to whisper across the way as if on his shoulder and not so far ' When I look down from the sky, things are small. I see fields of corn like grafiamads.' Daedalus in disbelief continued to listen to the vulture's cruel whispers ' People shrink to the size of dolls. I see you hate your nephew.' and then Daedalus began to whisper back ' No...' Talos looked to him yet Daedalus continued to listen to the vulture that only he could hear.
' Of course; he's everything you hoped for in your son and didn't get. You hate him. ' and the words began to stab upon Daedalus within, deep within where his heart festered an anger not just upon the bird but upon himself; most of all upon Talos. 'I'd love to fly. wouldn't you?' Talos remarked as he scratched upon the parchment in his hands, those god kissed and glorious hands. Daedalus nodded as if in a trance and answered yes.
' I dream about it.' he continued but Daedalus pressed in ' Do you think it would be possible for us to fly?' and the boy thought for a moment. ' I think you could make wings like a bird's, yes. I'd like to try.' and the pain was too much for Daedalus who now could hear little of anything else. His arms came around the shaken child and lifted him from the stone roof to the sky above them. ' Is that like flying?' he began to spin with the boy, his voice caressed by a madness.
' Uncle, no! Please-' Talos called to him but Daedalus could still not hear. He could only see the fear in the boy's eyes as their spinning grew faster and faster, more frantic and wide in circles. ' Don't worry, I won't let you fall. You're frightened. ' his voice heaved as he stared in a dark fascination ' Is there something my very, very clever Nephew is frightened of?!' He had lost his footing and with it, he slumped too far over, taking Talos over the edge of the roof's hold. The madness was gone as he held onto Talos's hand over the night of Athens. Only fear now, fear and realization of his senses. He was weak, shocked and holding onto the boy's hand for dear life itself. ' Hold on!' his true voice had returned but his strength had not. His grip loosened as the boy shouted and reached out crying for help. Finally there was none left and with a final clasp of the air, Talos fell. Twisting and turning like a starfish. He fell so slowly through the air it seemed to Daedalus he was falling forever; that he was never going to land, that he was flying. Then the ground reminded him. It came to meet Talos and jolted him asleep. ' What have I done? ' whispered Daedalus as he stared below, unable to look away from it all. He had killed Talos. He didn't mean to, he didn't know what he was doing. It was pain, it was pain. It was his heart breaking. He looked down on the boy's body. If he could have thrown himself off in his place, if he could have wound back those few seconds of madness but he couldn't. And so as Daedalus came to his son whom had fallen to rest in the hours of moonlight, he shook at his shoulder with a fearing grasp only a man whose heart soaked in guilt could. his father's words and shaking voice, a worry grew upon him. Yet sleep was still the master of his senses and so his mind only wondered so far ' What's happening? ' but Daedalus had already been hurriedly reaching for whatever tool or trinket that would serve him best. He had came back to his laying son and as he drew close from the darkness and into the night sky's light, Icarus could see the wetness of his cheeks and hear the labored breaths of his father, a man already in mourning.
' I can't explain. I'll explain later.' Daedalus's words were short and oh how he did not wish to speak at all for his mind wound and expanded with his fear and heartbreak. Icarus had indeed rose from the sheets and looked around to find only his father as company. ' Where's Talos? Is he coming? ' and Daedalus had paused as if grabbed by a dark reasoning that took away his voice for the briefest of moments.
' No. ' had been his only word for all he could feel was the warm wetness of his tears. ' Are you crying?' Icarus reached to comfort his father without the knowledge only Daedalus knew. His father had held him close if for a moment that seemed forever and hurried the boy. He picked him up and ran like a murderer from the city. Father and son traveled through Greece. Daedalus sold drawings, toys and hired himself out to petty kings and tyrants, squandered his genius on trifles and dreaded the nights,dreaded sleep. His dreams full of falling, falling. They never settled; always moving on, always looking over their shoulder until one day they set sail for the island of Crete. There in exile the once great craftsman made children's toys and sold them in the marketplace of Kenosis. A curious toy of his own; three little soldiers whose bodies were made of clay and whose legs, arms and sword raised at the same time drew interested eyes from many. Off they went, the little soldiers marching through the crowds and into the hands of a real soldier who carried them like precious jewels to his master. Minos, King of Crete, had seen much more than a child's toy. He saw only greed, ambition and a plan of his own in the craftsmanship. Minos saw a remedy to problems of his own and called for the craftsman to be his audience. ' Daedalus. All of Greece knows that name. ' The king's eyes stared so intently upon the man, his smile like that of a crocodile and his words of a snake. ' Welcome. What brings the great inventor to Crete and in rags?' Daedalus and his son stood before the king in his chambers and with quick thought he spoke.
' Difficult times, certain disputes and travel. This is my son; I wanted him to see more than the olive groves of Athens.' and the king's smile only seemed the wider. ' Yes, yes but difficult times... Oh that's right. I remember something about a talented boy that fell, is that right? He fell from the roof, tragic.' Daedalus could only look towards the marble floors as Minos continued on ' I make it no secret of my dislike for your city. Accidents at Athens- It was an accident, are not my...' but the king's eyes quickly turned upon the toy soldiers which sat upon his lap, a toying of earlier amusement. As his voice drifted away, Daedalus could see the lights in the king's eyes. Could see them upon him and knew they saw his guilt, could see the shadows of his crimes. Minos's smile had faded, only now a look of stone frozen in an ensnaring half snarl well kept beneath his piercing gaze. ' I...would not say no. ' and the king's smile had returned in a reflex as well practiced as theater. 'Really? That's- Oh I do love these...Could they fight each other?' He held the soldiers aloft his arms once more. And Daedalus did see of this clever creature who bellowed an echoing howl within it's dark chambers. He saw of it and felt a terror that reminded him another but did not replace. And people say that Daedalus did use his brain. That the maze he built to imprison the monster, the Minotaur, was designed like the brain itself; and a thousand years later it still stand here. So was Minos pleased? Minos was cruel, Minos had two secrets: Who the Minotaur was and how to get out of the labyrinth. Now Daedalus knew both of them. When the monster was taken into it's new prison, Daedalus and Icarus were locked in with it. Down there, somewhere in the heart of the labyrinth they wandered in the darkness. One whose footsteps were practiced and counting, the other in a panic. ' Father hurry, please, hurry! ' Icarus cried out as he ran ahead, but Daedalus took each step carefully and murmured whispers of numbers as his eyes crept among the walls and passages. ' Three to the left...Thirty... Thirty one. ; he continued to creep among the narrow halls and counting further aloud ' Two, three, five. ' and Icarus came to him again, his breath racing as his chest ached and voice ran as cold as the air itself.
' Father please, it's catching up to us!' And the two could hear the Minotaur's loud cries in the halls away, could feel it on their feet in the sands. It was catching up to them, and it was only a matter of time shorter than further that it would find them both; but from where? They would only know when it came for them. And with the monster almost upon them, Daedalus struck a wall with a palm of his hand, a door opened and they ran, Ran for their lives. Daedalus and Icarus, they had escaped from the labyrinth and the murderous charge of the minotaur but now what? Ports of Crete were heavily guarded. If they were seen, they would certainly be killed. They were marooned on this cruel island. They sat amongst a fire near a cliff where light could not be so easily seen. Sat in silence in rags of cloth blankets and watched the flames,felt it's warmth; but for Daedalus, all he could feel was the grip of betrayal by the cruel king and his mind working as he longed for a way out of a new maze. Just as his mind could go no further then, Icarus pointed past him and onto the great rocks behind. ' Look!' Icarus spoke in surprise and look did Daedalus to find a large bird that had settled near the tops of a fallen tree's branches and below the moon. It's great feathered wings came to close as it's black eyes stared down into Daedalus's own. It was the Vulture, come from Athens who knew of his hate, his regrets and his crime. Daedalus could only stare as it's beak parted once more and out came it's whispers in a mockery ' I can leave whenever I like. I stretch my wings, don't you think they're well designed?' and the vulture spread it's wings. shown it's dark feather's in the moonlight as if it were trying to hug at the night.
' Could we fly like Talos said?' Icarus spoke. His eyes were on the fire, his interests not a moment longer on the great bird and unable to hear a dark word it ever spoke. ' Talos is dead.' Daedalus could only say as a cruel reminder to them both. They sat a moment in silence until Icarus spoke once more amongst the crackling wood ' How did he fall, father?' and before Daedalus could speak, the Vulture whispered so aloud the soft winds. 'You killed him.' Daedalus looked back towards the vulture once more ' No! No!' he said louder and got to his feet ' It was a game! We were playing at flying!' but the Vulture only continued to mock and convict the man with a fever as he drew nearer and nearer ' You killed him!' it whispered and Daedalus could hear it no more, could not bear it any longer; and in his rage, Daedalus flung his blanket over the bird. They struggled and fought until there was a terrible crack in the great bird's neck and it snapped. He held the blanketed Vulture towards the moon and brought it back down upon a stone with a weighted heave. It's head had come loose from the covers, it's dead eyes opening to stare upon Daedalus a final time.' Love him Daedalus. Love him to death.' and with those words it's head fell back to the stone to never stir again.
' Leave it, leave them!' but his son had already been at his knees to collect of them what he could. ' I'm sorry, I was only trying to help!' ' Yes, but it's too important...if it weren't so important.' but Icarus had spoken in haste ' If I weren't so clumsy. If I was Talos. ' and it had been too much for Daedalus to speak further. He only continued his work in the silence of the day. Finally upon their making, Daedalus had fitted both wings to him and his son and taken to another cliff whose fall were higher than all others on the island. Above the oceans and only then rising morning sun. Daedalus looked ahead the tide with Icarus beside him, and then Daedalus drew close to his son. Daedalus stared into his eyes with a doubt, a worry and he brought his son close as he hugged him tightly in silence. ' We're not saying goodbye are we?' Icarus asked Daedalus as he hugged him back. Daedalus clung to his son on the hill then he kissed Icarus on the head and it seemed as if some great bird that was feeding it's chick mouth to mouth as birds do or that Daedalus was willing his knowledge into his clumsy son. Then they turned and ran to the cliff edge then up, out and away. Away from the lands controlled by Minos...flying. For the first time, Icarus and Daedalus felt a great freedom in the gusts of winds as they spread their wings and flew above the oceans below to the clouds above. ' I'm flying, I'm flying! ' Icarus called to his father in a thrill that Daedalus too shared. ' Stay close! Not too low, not too high!' Daedalus called back as his worries still followed him. As they stared down the horizons and crossed the hours and air, it seemed as if those too began to fall away into the waters below for Daedalus had seen his dreams and forgotten of his sorrows, of his fears and dreams that crept upon him in the nights. But Icarus did not stay close. As the Earth shrank beneath him, he beat on up, past clouds, past listening, past promises. As the sun drew upon his wings, the feathers began to pluck away in the winds and Icarus could not see it in his excitement. Icarus flew on alone higher and higher and higher towards the sun and bead by golden bead, the wax started to melt. When he had finally felt the struggles upon him, as the wings began to break apart and feathers vanish in mounds, did Icarus call for his father in a great fear. His father could hear of his son and could only begin to see him crying out as he began to fall amongst the clouds.' Father please help!' Icarus had called a final time. Too late. Icarus fell, fell down and down into the sea that bares his name. His father cried out his name into the darkening clouds of rain. Icarus had died. Why had he flown so high? I think that when Talos dropped from the sad heights above Athens, Icarus was already falling. As if a single thread had held them all together. Talos fell, Icarus fell, Daedalus fell. And it was too much for Daedalus who only held Icarus's limp body close ' My son! My son!' he wept as he sank to his knees in the waters and let his tears be lost in them. His words however were not, for the sea has many ways to hold onto such things as secrets and words. Such words that to this day still remain. Daedalus buried his dead child in the sand, burried hope and laughter and joy, laid the clumsy fingers in the ground, placed an obble in the foolish mouth and kissed the cold forehead. Then Daedalus flew, his tears falling from the sky like rain, away from Crete, away from danger, away from grief. Northwest to Sicily and to king Cocalus. Cocalus was pleased to welcome such a craftsman and Daedalus set to work again but as well as buildings ships and machines, this time he started to make models. Tiny figures of a winged boy. Daedalus, he blamed himself, he blamed himself for everything. He would catch himself at his work table in the middle of something quite ordinary. Gluing a joint, sharpening a tool, with tears falling. Only children could reach him. The kind king had two daughters and when they came to visit his workshop, people said it was the only time the great artist smiled. ' I'm so tired I'm going to sit down!' Daedalus would say softly in a voice unlike his own as he played a puppet to the girl's amusements. ' I've had such a nice meal! I'm going to burp!' and the children giggled as they smiled at his play.
' Now I'm going to have a sleep.' He'd laid the puppet down along it's strings and the two clapped to applaud the maker. ' You're so clever!' the elder of the two spoke and Daedalus came to sit with a soft smile. ' Am I?' he asked as the younger girl noticed a toy to the side of him. ' That's funny.' She said as she reached and took hold of the small statue of a boy whose arms outstretched with wings, cast in clay. ' A flying boy. ' And Daedalus carefully took of it into his hands to stare upon it. There was unfinished business between Daedalus and Minos. Daedalus blamed Minos for the death of his son. Minos wanted Daedalus dead too. He knew too many secrets. Minos would not rest until he found him; he brooded on ways to tempt Daedalus from his hiding. He took a shell from kingdom to kingdom and if you listened closely, put your ear to it, you might just hear...' I am Minos, Lord of Crete, emperor of Kenosis, Ruler of all the sea's between Greece and Egypt.' Minos spoke before the King Cocalus and audience. He had spoken in this way many times and always drew an offer that none could hope to solve for it's reward. ' This is a Triton shell.' he held the shell up and beckoned with a soft gesture for one of Cocalus's daughter to come nearer. Minos's smile only grew as the young girl drew near ' Hundred of thousands of tiny passages.' and then he held a line of gold thread in his own hand to the girl.
' This is a fine thread from the dress of my Queen, Queen Pasiphaë. If any one can pass the thread through the shell, this treasure is theirs.' and with this his subjects brought within a most large wooden chest which was then open. The shine of gold, gold to the tops to nearly spill out onto the floors glinted in the day's light. And so the daughter did bring this shell back to her father who looked at it curiously, all the while the King Minos looked upon them with the same look as if beams were coming from his eyes to see more. In his workshop, Daedalus had the shell brought to him and his mind began to set on how the thread could pass. The answer had been simple; clever and simple yet only in his mind. An ant scavenged amongst the shell as the two daughter's watched Daedalus in his seat. ' Nature makes such clever things.' he said as he turned and followed it. ' Where are you going?' He asked as his other hand dipped it's fingers into a bowl not far below ' When I had been in Crete, I had designed a prison for King Minos like a maze. This shell is like a maze.' He dabbed a finger at one end and tasted of the strange thick liquid on his finger. ' That's honey!' the younger girl spoke. The man placed the ant into the shell's opening and watched it drag the thread inside with it. King Minos had come to find the golden thread through the other end of the shell and smiled as a great wolf might smile upon it's captured hunt. ' The reward is yours, King Cocalus, clever.' King Minos once more stood in audience of the king's chambers. ' There's only one man in Greece who could do this. The man who designed the labyrinth of Kenosis, who killed his nephew, the wandering genius, Daedalus, the man who can fly. Where is he?' with every word the King's voice grew deeper and darker, his smile wearing into a a scowl as he stared into the king's eyes with that same deathly stare he had given the one he came for.
' There are twelve ships in the harbor, armed and ready to fight, weapons fashioned by your engineer. Give him up to me.' There had been little choice and as much Cocalus did not wish it, he gave of Daedalus who sat in his own chambers waiting for Minos to come for him. The two daughters however had made it to him first. with the final strings cut, the puppet fell to the floors below. Was he killed, Had King Minos had him killed? He planned to. He took a bath before his feast, smug at his skill for luring Daedalus from his hiding, planning the execution. But as Minos lay there, steam surrounding him in a bath Daedalus had designed, Daedalus made his own plans and he was the master of plans. What could it involve? A clever machine? no, No machines, just water. Water heated in a cauldron over a fire. Daedalus had designed the bathhouse, knew every pipe and channel, noose and drain. When the water in the cauldron was boiling, he emptied it into the pipes. The water came pouring from above onto the king who could only scream as the hot waters descended upon him as if Daedalus's own vengeance itself came on him. Those screams soon ended and the king was king no more. Only the silence of the bathhouse and the steam that rose from it. Minos had been boiled. Water took his son from him, water killed the king...but there's no peace in vengeance, no rest in revenge. Daedalus survived but sometimes he wished he hadn't. Sometimes as he sat upon his workshop day upon day staring at nothing, he wished he'd gone back to Crete and a quick death. Not the slow dieing inside. He sat in the corner of his workshop, alone with the statue of a boy who had wings. Watched it fly with his hands as he brought it close to his chest and heart that had been broken so long ago. The tears still fell from his cheeks as he looked into the daylight and waited. Daedalus, the man who could make anything...except a way to turn back time, a way to change the past, a way to turn solid stone into flesh.."
And two birds flew toward the moon, or were they men?' They did not know, would never know probably, but perhaps there are still some gods that play with us. That give us hope, that give us...time. 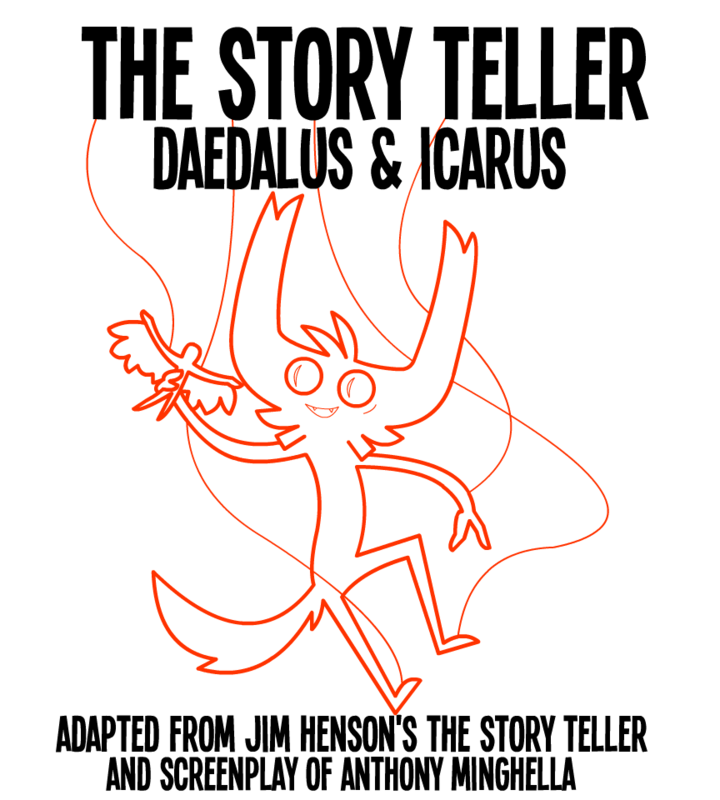 This was a written adaptation which used greatly of the spoken dialogue featured in Jim Henson's The Story Teller: Greek Myths; While also attributing the origins of the dialogue to the late Anthony Minghella. This was a written love letter of sorts to their lost genius that has been highly inspiring and passionate for myself. Curious of the Story Teller? Please be sure to follow the provided link below to the featured episode this writing adaptation was based on! Did you enjoy this adaptation? Please leave a comment below! Want another tale? what if I told you about a young boy whose fate started in darkness and secret, whose destiny was to meet a cursed woman at the end of the earth? A woman whose hair was a nest of snakes and eye could turn one to stone. I, for one, never knew this series existed until now. You have broadened all our culture. And that puppet title is amazing. XD Beautiful adaptation. Thank you. I, for one, never knew this series existed until now. You have broadened all our culture. I am most glad you enjoyed of it, as it was in it's own way, a joy for myself to partake in. I can only hope it would inspire yourself to perhaps peek upon the show and see a marvel of a series lost to time. >_>;; I actually watched almost the entire season yesterday morning after discovering it. Indeed, the stories of the series were often most enjoyable. I would highly suggest it's first season which consisted of older Tales whose origins were of Irish, British and further on. A treat for those that enjoy fine fables, fine music, tellers and all those glorious contributions to our senses.